It’s easy to take automatic doors for granted; after all, they open and close, you walk in and you walk out. What could possibly go wrong? With a range of key safety concerns to be considered – such as whether the safety sensors are working as prescribed and if the door forces and speeds are as they should be – a professional maintenance schedule is one of the recommendations of BS EN S16005; although some faults, accidents or mishaps cannot be foreseen. It also pays to take some time to self-maintain your doors, as this can help to avoid the more common problems. Commit to a regular and detailed visual inspection. Occupier safety checks will help you to spot any tiny cracks and you can make sure that any warning or advisory signs are still in good condition, correctly positioned and clearly visible. These checks should also identify any objects that might cause any kind of obstruction. It’s worth listening carefully when the doors are in operation; if you are familiar with how they should sound, any changes will be noticeable. You should run a test to confirm the continuing efficiency of the approach sensors – whether passive infrared or radar movement, pressure mats or access code readers – to make sure the doors open and close as they should. 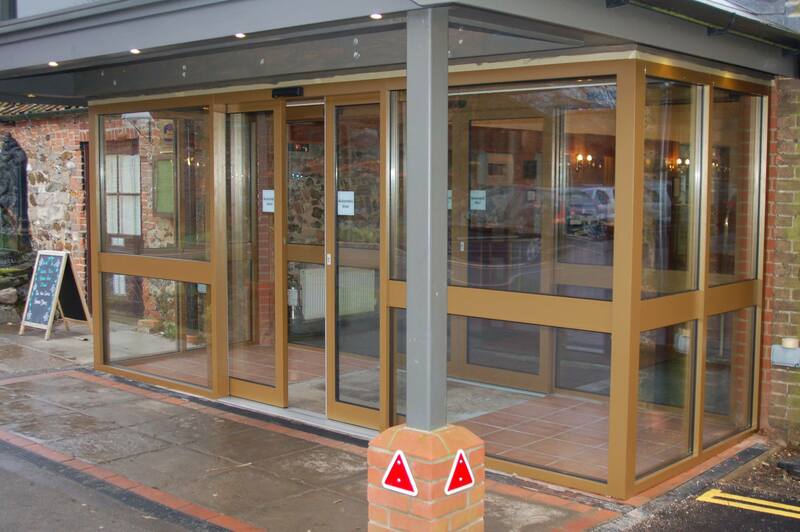 A key moment to assess the general performance of your automatic doors is during a fire or emergency drill. A common situation that often leads to a door sticking is the accumulation of debris in or around the lower track – this is so often overlooked. Where appropriate, lubricants can be applied to aid smooth operation. It also pays to oil all door locks, perhaps using an aerosol lubricant to de-grime and coat the operational areas. Some sliding doors have an adjustment screw; this marginally raises or lowers the roller and it can help the doors to move a little smoother. If you feel yours are stiffer than they should be, it’s worth checking for this option. None of this is rocket science but you would be surprised how much difference it will make to the overall performance of your doors. Remember that professional servicing and maintenance safety checks need to be carried out by a trained and authorised technician who holds BS7036 or BS EN 16005. If the door complies with the relevant codes of practices and/or risk assessment, Automatic Access will issue a safety certificate for your records. For any further advice, you can always contact Automatic Access on 0116 26950505… we are always happy to help.